Has bright covered soft eye splice for high visibility and protection of splice. When using synthetic ropes, the rope can become trapped in the corners of a roller fairlead and pick up damage. Equally, aluminium hawse fairleads can be quickly worn by mud and grit as the rope passes over them. Made in high-nickel, 316 marine-grade stainless steel, the fairlead looks superb on the vehicle. Our unique, one-piece cast design provides a completely smooth finish with no edges to snag your rope. 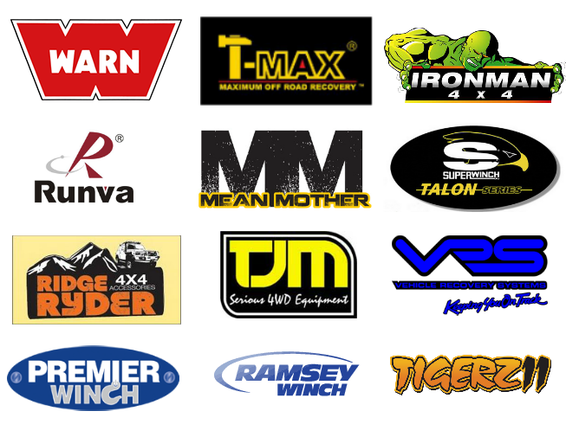 Available to fit Warn winches. Please check compatibility with other winches before ordering. Gigglepin rope Splicing kit. Our rope splicing kit is designed to provide an easy to use product to all users of synthetic winch rope. The kit comes in a plastic tube which can be easility stored, no matter if your a competition, recreational or commercial user, this kit is jsut what you need to splice synthetic ropes. 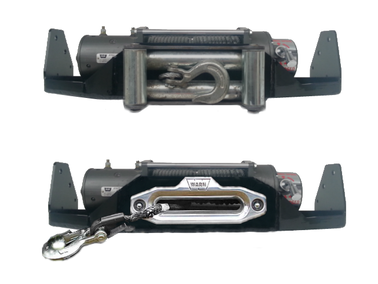 Our winch cradle solves the problem facing many Patrol owners. 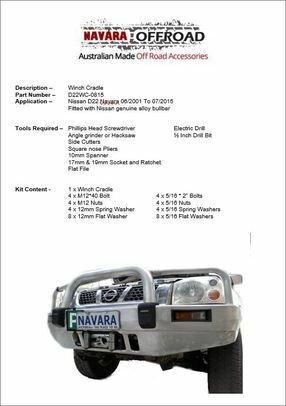 Until now you couldn’t put an electric winch into your Nissan Patrol fitted with a genuine alloy bullbar as there wasn’t a winch mounting plate available. With our customers in mind we developed this cradle to solve the problem. Made to suit 99% of winches on the market. When designing this winch cradle compatibility was a key requirement. That’s why we employed the Warn Winch mounting footprint. Warn has become the industry standard for electric winches and as a result most other manufacturers have copied their mounting specifications. Roller or Hawse fairlead compatible. Whether you’re running synthetic rope or steel cable we have you covered. Once again we utilised the industry standard for the fairlead mounting so both roller and hawse fairleads will fit. Made from 8mm cold rolled mild steel they are strong, VERY STRONG! Not only that, they come finished in a gloss black powder coat finish to ensure it stays looking good for years. There is no need to change to a steel bullbar just to fit a winch. 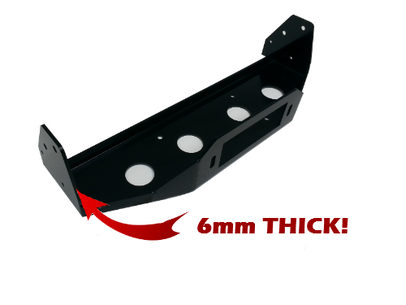 At a fraction of the cost to replace your bullbar you can achieve the same result using our winch cradle. No need to upgrade front suspension. Thanks to our comprehensive fitting instructions installation couldn’t be easier. Even people with little mechanical knowledge can competently tackle the install. If your Patrol was built prior to 7/2001 you will require this additional Nut Kit. Please contact us to order these. The kit comes with all the necessary components for the installation. A full list of components is provided below. Can I fit this winch cradle myself? Yes. Thanks to our comprehensive “step by step” fitting instructions installation couldn’t be easier. Do I need any special tools to fit this cradle? No, we have designed this winch cradle in such a way that only basic hand tools are required to perform the installation. Will it fit my bullbar? Over the years Nissan has released a number of alloy bullbars for the GU Patrol so to be sure please contact us for conformation. How long will it take to fit my winch cradle? A competent mechanic should take about 3 hours which includes removing the bullbar, installing your winch onto the winch cradle and refitting the bullbar. This time will vary however depending on the experience of the installer. Has this winch cradle been certified for airbag compatibility ? The winch cradle was designed with air bag compatibility in mind and utilises the same mounting points as that of the Nissan air bag compatible steel bullbar. However, crash testing and certification has not been performed therefore the product is for non air bag models only. Our winch cradle solves the problem facing many Navara owners. 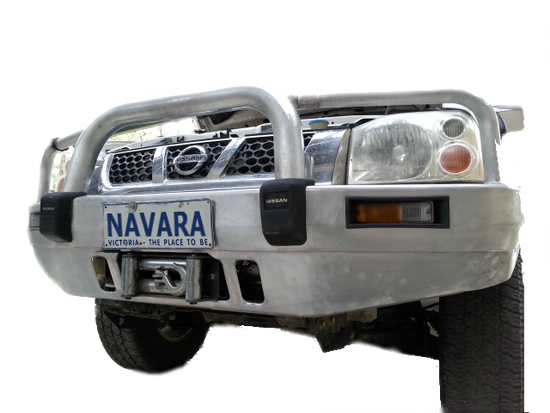 Until now you couldn’t put an electric winch into your Nissan Navara fitted with a genuine alloy bullbar as there wasn’t a winch mounting plate available. With our customers in mind we developed this cradle to solve the problem. When designing this winch cradle compatibility was a key requirement. That’s why we employed theWarn Winch mounting footprint. Warn has become the industry standard for electric winches and as a result most other manufacturers have copied their mounting specifications. Made from 6mm cold rolled mild steel they are strong, VERY STRONG! Please note additional freight charges may apply for remote areas.